Jim Vail, MMR, passed away January 28, 2018: he was 83. Jim was a close friend, and a long-time GAZETTE author. Irene and I will miss him greatly. I first met Jim in the early 1980s when I was in a group that was invited to visit his first HOn3 layout. Jim’s daughter, Kate, then 10 years old, and in the Fifth Grade served refreshments. Jim often joked about her reaction when she found out that one of the group (me), was a Fifth Grade teacher. Soon after that visit, I asked Jim to write for the GAZETTE. His first article, “The Rail Line Boxcar,” was in the May/June 1982 issue. In November/December 1982, he described his HOn3 Glenwood and Black Creek Railroad – the layout we had visited. In Jim’s next article (March/April 1984), he described how to assemble an HO Chooch Country Store kit. I had been so impressed by how well Jim’s HOn3 layout ran that I asked him to do a series, about getting a layout to run. 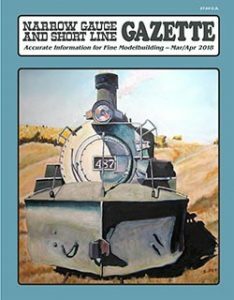 He titled it: “Getting Them Running,” and the series began in the January/February 1988 issue with an article on attaching automatic couplers to the front pilots of HOn3 locomotives. His series eventually became a column and it continued in every issue for some 29 years – until the November/December 2017 issue – never missing an issue. Irene was always pleased to get a column from Jim to edit. They always arrived on or before deadline, in good condition, and required little or no additional research. Counting his earlier articles Jim shared his ideas and enthusiasm with GAZETTE readers for some 35 years. Here are the publication dates and titles of some that I most enjoyed. In May/June 1988 Jim described “Realistic Carter Brothers Flatcars,” followed by a “Coupler Height Gauge” in September/October 1988. In the March/April 1989 issue he began a seven-part series on “Painting a Brass Locomotive.” (Remember, this was before you could buy brass locomotives pre-painted, lettered, and weathered.) Jim was kidded for needing seven issues to complete this series, and its parts soon had titles such as: “More Painting A Brass Locomotive,” and “Still More…” However, Jim’s painting series was very well received – and very helpful. When DCC first became popular, Jim wrote about installing decoders. He even had (and described) HO scale marker lamps that could be switched from white to red or green, from a hand-controller. Jim was also the hub of narrow gauge modeling in the Santa Cruz, Calif., area, and in the southern San Francisco Bay area. Jim and his friend, Dave Adams, builder of the On3 Durlin Branch of the D&RGW, alternated monthly operation sessions (see July/August 2017 GAZETTE), which drew modelers together for a day of enjoyable operation. It also seemed that Jim’s layout was always open during local NMRA Coast Division meets, Pacific Coast Region Meets, and NMRA National Conventions. He was also open for the 2004 National Narrow Gauge Convention held in Santa Clara, California. He organized clinics for the convention, and did such a good job that several subsequent Narrow Gauge Conventions asked him to organize and run their clinic programs. I remember on the last day of clinics in Santa Clara, getting a phone call from Jim, right in the middle of dinner. Seems someone had backed out of a clinic, and he needed to fill the spot. Would I do it? I said, “Yes” – forgot my dinner, and rushed to the convention center with slides in hand to do my clutter clinic. Jim earned his NMRA Master Model Railroader Award the same year I did. 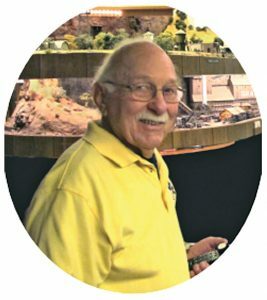 He served as a mentor to several local model railroaders, and corresponded with modelers around the world. He was invited to an Australian Narrow Gauge Meet, and while there gave several clinics and a talk. But, while doing all of this Jim was always a gentle, easygoing, modest fellow. But he didn’t put-up with modelers who only talked about modeling and never did any. Jim also loved cars, and built two street rods; he was an enthusiastic jazz fan, and he and Eric Bracher founded the Narrow Gauge Hall of Fame. Jim was a close hobby friend of mine. I was always inspired when I visited his fabulous layout. I don’t think I have seen a better one. Jim had blended his favorite railroads into one layout, and it all worked beautifully. He had the Denver & Rio Grande Western; Rio Grande Southern; Colorado & Southern; Denver, South Park & Pacific; South Pacific Coast; West Side Lumber, and some standard gauge HO on his layout. A small bathroom off his main layout room contained a waterfront with large ships, a skid row, an SPC station, and the Ophir Loop, all together, and all beautifully done. His RGS High Line ran right above his Forks Creek, and does not look out of place. Over the years Jim shared all of this with readers though his articles in the GAZETTE and other magazines. I depended on Jim for advice, and often phoned him, especially after I installed DCC. I remember one time when I thought I had blown out my booster. I called Jim and he drove the 60 or so miles to my house, looked at the booster, and said, “Yep, you blew it.” So – I got a new one. Many evenings I would call him about a problem, and he would tell me what to do, and then call back in a few minutes to see if what he had advised had worked. What a guy! The people who knew Jim, personally, and the thousands who knew him only through his articles, clinics, or at conventions have lost a friend. He was an inspiration – he once told me he “loved” the hobby. I believe he did, and I appreciated this love and will miss it. Now, who will I call when my DCC conks out? Our condolences to Jim’s daughter, Kate – and to his granddaughter, Gabriella.